12 March 2008, Dr Rebecca Hill and Colin Waghorn: We are writing to you with regards Sir Titus Salt's parents' family bible. We have had in our possession for some time a large family bible which came from a house clearance. It was some time before I realised to whom the bible belonged as the 'family entries' are in the middle of the bible, and so are not apparent at first glance. When I realised that the bible pertained to Sir Titus Salt, his parents and all his siblings, I contacted both Bradford Town Hall, and also Mr Jack Reynolds, who had just published his book on Titus Salt, really to let them know that I had this information and to see if it would be of interest. Unfortunately there didn't seem to be any interest. Over the years I have kept my interest in Sir Titus Salt, and was therefore most pleased to see that a history club had started in Saltaire, as I thought that you might find this information useful. As I hope that you can see, where I have photographed the pages, the dates and times of the births of all the Salt children, their Christening dates and places and by whom they were baptised are listed (as well as their untimely deaths). Anyone interested in Saltaire must surely be interested in this information, as as far as I can tell this information is not public knowledge at this time. I realise that Titus Salt had his own family bible which is now I believe in the Salt family's possession. I hope that you will find this information of interest for your society and for anyone who is interested in publishing information about Saltaire. 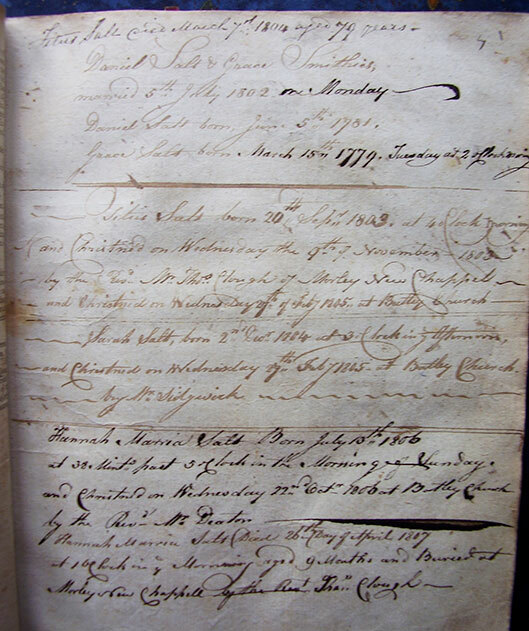 Daniel Salt and Grace Smithies married 5th July 1802 on Monday. Daniel Salt born July 5th 1781. Grace Salt born March 15th 1779, Tuesday at 2 o'clock. Titus Salt born 20th September 1803 at 4 o'clock in the morning and christened on Wednesday the 9th of November 1803 by the Rev. Mr. Tho. Clough of Morley New Chappel (sic) and christened on Wednesday 27th July 1805 at Batley Church. 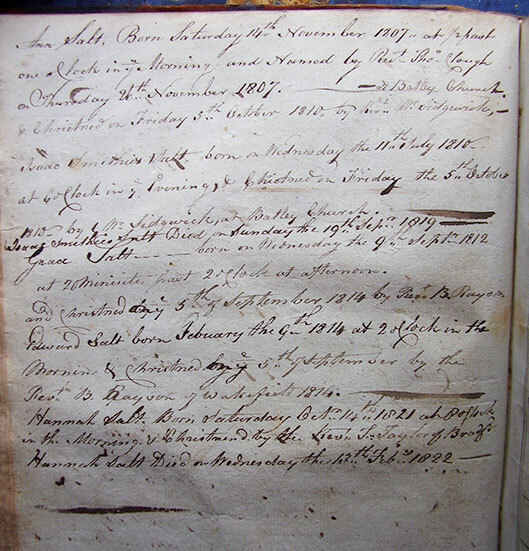 Sarah Salt, born 2nd Dec. 1804 at 3 o'clock in the afternoon and christened on Wednesday 29th Feb. 1805 at Batley Church by Mr. Sidgwick. Hannah Maria Salt. Born July 13th 1806 at 38 minutes past 5 o'clock in the morning of Sunday and christened on Wednesday 22nd October 1806 at Batley Church by the Rev. Mr. Deaton. Hannah Maria Salt died 26th April 1807 at 1 o'clock in the morning aged 9 months and buried at Morley New Chappell (sic) by Rev. Tho. Clough. Isaac Smithies Salt born Wednesday the 11th July 1810 at 6 o’clock in the evening, and christened on Friday the 5th October 1810 by Mr Sidgwick at Batley Church. Isaac Smithies Salt died on Sunday the 19th September 1819. Grace Salt born on Wednesday the 9th September 1812 at 20 minutes past 2 o’clock at afternoon and christened 5th of September 1814 by Rev. B. Rayson. Edward Salt born February the 9th 1814 at 2 o’clock in the morning and christened 5th September by the Rev. B. Rayson of Wakefield 1814. Hannah Salt born Saturday Oct. 14th 1821 at 2 o’clock in the morning and christened by the Rev. J. Taylor of Bradford. Hannah Salt died on Wednesday the 13th Feb. 1822. Dr Rebecca Hill writes: With regards the history of the bible, Colin Waghorn is a collector of ephemera, and has been since he was a child. He was in Oxted Surrey at the time that the bible came into his possession about 30 years ago. Everyone local knew that he was interested in any paperwork, and as such people would bring things to him in the hope that he would buy them. This was the case with the Salt bible. It was one of four bibles that was brought in by the bin men – all in the same week! They had come from a house clearance in Oxted. The bin men bought one in each day which Colin bought from them. The Salt bible was the last one they brought in on the Thursday. (They knew that they would get more money by bringing them in one at a time). As the first three bibles had nothing in them, a few weeks passed before Colin looked in the Salt Bible. Unexpectedly, instead of finding the family tree inside the front cover, it was in the middle of the bible. This still didn’t mean much to Colin as he had never heard of Titus Salt, and it wasn’t until he was watching a television programme called ”Victorian Values” presented by Bamber Gascoigne that he became aware of the great Philanthropist. He then contacted Bradford Town Hall and to his horror, the young gentlemen to whom he spoke, first didn’t know who Titus Salt was, and second said “ family bibles aren’t worth anything you know”. Colin was not impressed by this and said “did I ask for any money? I was just making you aware that I had it in case anyone was interested”. The conversation was obviously cut short at this stage, and for the next 20 years the bible stayed in Colin’s collection. Dr. Rebecca Hill and Colin Waghorn first got in touch with the Saltaire Village website in March 2008 and I was thrilled with the information she shared. The fact that Sir Titus Salt's parents, Daniel and Grace Salt, took such care to memorialise Daniel's father's death date, their birth dates, their marriage, and their children's births (and for three of their children, their deaths) is profoundly touching. My intention was to publish the images and information on the website, and somehow, I didn't follow through; human fallibility, and I apologise profusely. My error is all the more poignant considering that Dr. Hill and Colin Waghorn had made previous attempts to share information about Daniel Salt's bible, and had been rebuffed and ignored. I would like to thank Dr. Rebecca Hill for following this through. I am humbled and extremely grateful. Without her most recent email, (8 September 2015) this important piece of social history might have been lost. Many, many thanks. Pamela Reynolds, 8 September 2015.